GB Boxing is getting behind the biggest multi-sport talent identification campaign in British history, which has been launched with former GB boxer, London 2012 gold medallist and current heavyweight World Champion Anthony Joshua, Olympic Rowing icon Sir Steve Redgrave and Olympic Skeleton Champion Lizzy Yarnold among those urging you to #DiscoverYour Gold. 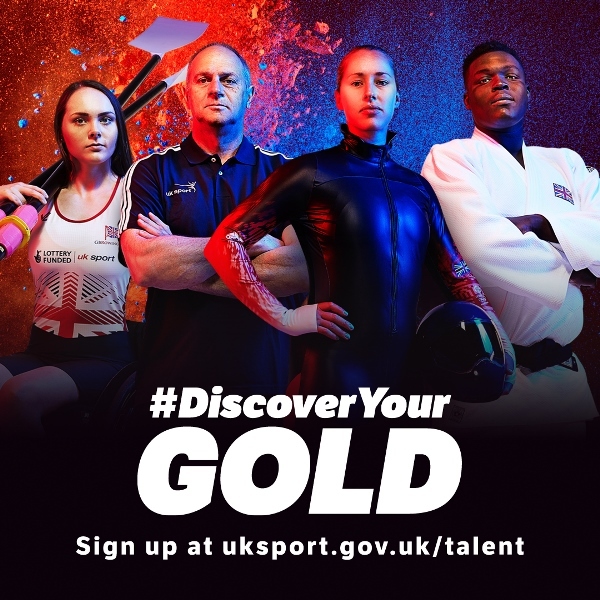 Over 20 sports are involved in #DiscoverYour Gold, a partnership between UK Sport, the English Institute of Sport (EIS), and a range of National Governing Bodies, targeting 15-24 year old males and females to be fast-tracked into the exciting world of high performance sport. Launched yesterday (July 12th) at the Lee Valley VeloPark, the campaign aims to identify talented young athletes who could be challenging for medals at Tokyo 2020 and beyond. Sir Steve Redgrave, who launched the first talent identification campaign Sporting Giants seven years ago, said: “UK Sport and the English Institute of Sport have an impressive track record of discovering great British talent. “I have seen the impact of similar schemes after Sporting Giants discovered Olympic Champion Helen Glover but #DiscoverYour Gold is the biggest and best yet. Anthony Joshua, the current IBF Heavyweight World Champion and Olympic gold medallist, is please to back the #DiscoverYour Gold campaign after elite sport helped him turn his life around. The boxing star said: “I was very lucky to find the sport of boxing which set me on the exciting path to the London 2012 Olympic gold medal and World Heavyweight Championship. “DiscoverYour Gold is a fantastic campaign from UK Sport and the EIS that will help unearth the champions of the future. “Becoming an elite athlete isn’t easy but if you combine talent with hard work, dedication and the right support, absolutely anything is possible and I am proof of that. Since 2007, the UK Talent Team (the campaign arm of the Performance Pathways Team) has worked in partnership with 22 Olympic and Paralympic sports and over 100 World Class coaches; run 12 National athlete recruitment campaigns, and assessed over 9000 athletes. These projects have resulted in over 100 newly identified athletes entering the World Class system with over 600 international appearances made and over 250 international medals won. Liz Nicholl, Chief Executive of UK Sport, said; “#DiscoverYour Gold is all about ensuring young people with raw sporting talent get the opportunity to reach their full potential no matter what their background. “We are looking for athletes with raw speed or power. You might just be in the wrong sport, but with the potential, with access to the right training and support, to become a future Olympic medallist. Nigel Walker, National Director of the English Institute of Sport, said; “The Rio 2016 Games are less than a month away and we are expecting great things in Brazil but it is important that we maintain a focus on unearthing the next generation of Olympic and Paralympic stars. “#DiscoverYour Gold is a fantastic campaign that should help us retain our position as one of the powerhouses of Olympic and Paralympic sport as start to look at Tokyo 2020 and beyond.